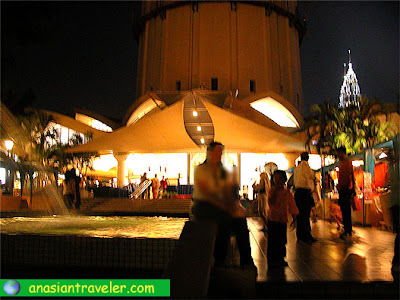 We spent a languid late afternoon at Menara Kuala Lumpur (known also as KL Tower). 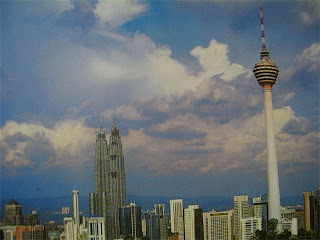 It is the tallest concrete tower in the world and the tallest communications tower in Southeast Asia. 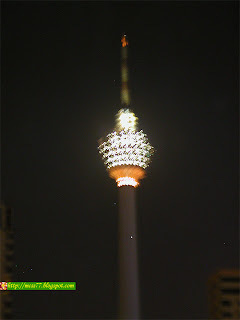 Currently, Menara Kuala Lumpur is the fourth tallest telecommunications tower in the world after the CN Tower of Canada, Ostantiko Tower of Russia and Oriental Pearl Tower of Shanghai, China. 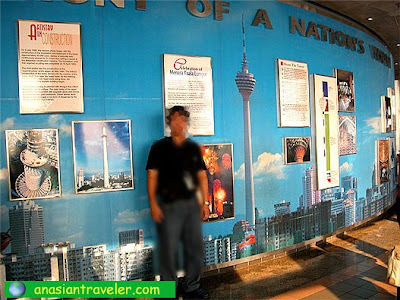 Acting as the country's main telecommunications and multimedia broadcasting tower, KL Tower is situated atop Bukit Nanas at 94m above sea level, on a higher ground than Petronas Twin Towers. We admired the lavished intricate glass of Muqarnas architecture (the extravagant Islamic motifs) located at the lobby entrance, as well as the lift lobby and soffit of the tower head. After we bought our ticket, we went to the theatrette (ground floor), and we watched an interesting 15 minutes docu-video that covers everything about the tower's construction. On the ground floor, there are also an amphitheater, a prayer room, ticketing counters, booths and several shops selling various souvenir items and 'a scene to believe' digital studio (amazing studio for simply out-of-this-world photographs). 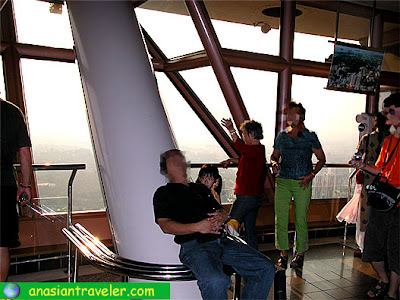 After watching the film, we headed and took the express elevator to the Observation Deck. Upon entering the staff gave us an Audio guide that provides comprehensive information of the City Skyline. 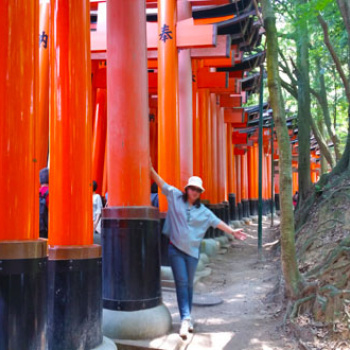 Currently the Audio Guide is available in nine languages, which is English, Bahasa Malaysia, Mandarin, Cantonese, French, German, Japanese, Arabic, and Thai. The tower head has 8 floors that include an observation platform, a revolving restaurant, a telecommunication, a building service floor, a broadcast station and a meteorological station. 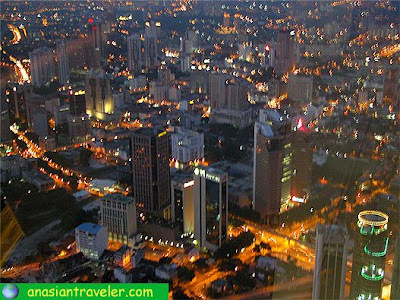 At a soaring height of 421 metres and overlooking the glorious view of the rising metropolis of Malaysia. There is a tower terrace in the ground floor where you can relax to the sounds of a cascading pool and mist fans cooling you down.